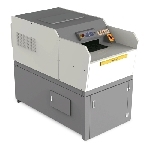 These high capacity paper shredders are designed for large volume shredding in a central location and can serve the needs of an entire organization. Each industrial paper shredder machine is powerful enough to shred just about anything, including entire files, stacks of computer forms, cardboard, tapes, ribbons, CD's and magnetic disks. In this collection of high capacity paper shredders, you will find industrial paper shredder machines that utilize fully-automated features such as auto start/stop, auto reverse, and auto cleaning. For continuous destruction operations, these machines have a trusted record of performing reliably across a variety of situations—perfect for industrial-scale operations of any type. Standard 1/4" x 1/4" w/ +/- 10% variance up to 1/4" x 1 1/2"